Wouldn't that make it Hockley Hill? It does say Soho Hill on the photo. Probably wrong anyway ,not sure where hockley hill ,and soho hill start and finish. jo you are quiet a way off with key hill...look at the 2 men standing by the lampost on the left..they are standing out side the roebuck pub..corner shop on the left is at hampstead road and wretham road...wretham road straight ahead...everything from the right hand corner shop going down soho hill is is long gone including the congregational chapel..the corner shop on the left is still there and is now undergoing restoration after many years of being in a sorry state. Ican see it now lyn ,any idea what year it was . before your time jo...prob about early 1900s at a guess..ive got a great pic of the congregational chapel you can see in the photo..give me a min to post it..
good view of the roebuck on this one.. The view today. Nearly the same but So much better don't you think. Don't know the area myself, it was the rough end wasn't it. not back then it wasnt..
Well for a start there were all those grotty old buildings that we thoughtfully knocked down for our viewing enjoyment. Then there was the painstaking accumulation of natures overgrowth and our litter that has produced a scene worthy of the Tate Modern. Throw in the destruction of our domestic religious palaces to make way for colonial equivalents. Don't forget the careful attention to the gentle but continued deterioration of great social centres of attraction. And what have you got? A promised land, of sorts. A sight to behold. One that I passed at least four times a day for five years, not counting my childhood, and never once thought it may have been the centre of such Victorian ugliness. A place from where my ancestors were vending liquor to the unwashed and illiterate masses, whilst at the same time making sure they had guns aplenty. I'm sure that if they had known that most of it would be swept away to allow six car families from abroad easy access to their new found promised land they would have built bigger and possibly better things to be sacrificed in the name of progress. But they never guessed. How could they, poor uneducated saps. Things just happened around them. Not like today, where we know we are getting screwed like the barrel of a gun, by our chosen representatives, yet still have no say in it. Thank goodness we are smarter and better informed. I have now positively identified that this photo was taken from outside No.11 Soho Hill. The steps built into the substantial wall on the right are leading up to the front door of No.9. No.9 is on the corner of Claremont Road, it has a yard and extension on the Claremont Road side and has been used for many things including Builder, Stonemason, Ladies Hairdresser and Antiques Shop. On the other side of the road junction there is a bus stopping at the bus stop which is outside The Watt Tavern. The Watt Tavern is at No.7 Soho Hill. 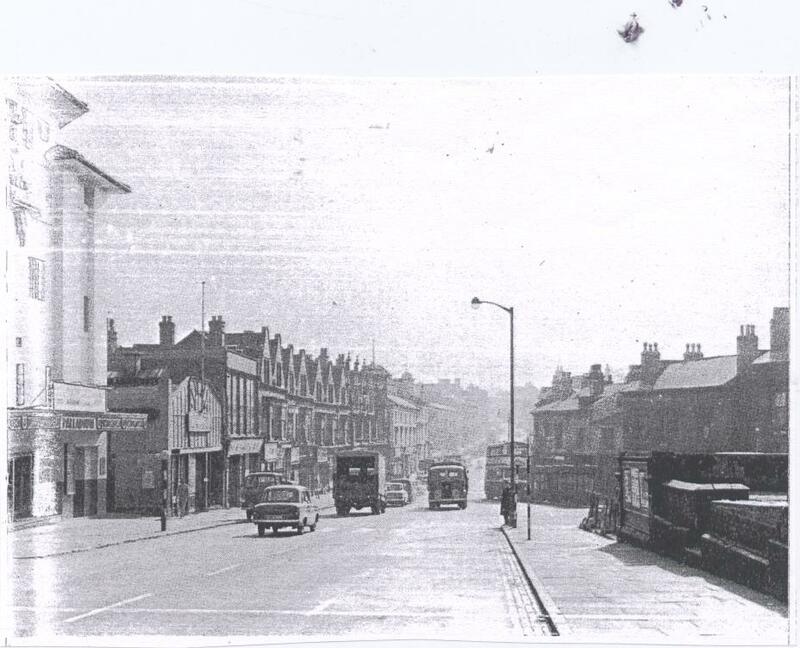 The building to the right of The Watt Tavern is in Claremont Road, the photo doesn't make this very clear. No.9 Soho Hill as seen from the junction of Claremont Road and Soho Hill, the zebra crossing goes over to The Palladium.